5S Color Coding, Pipe Marking, Lean Programs, Arc Flash Labels, GHS, NFPA, Six Sigma, and more.. The LabelTac 4 and 4 PRO Industrial Thermal Printers are the easiest way to print all of your 5S, Pipe Marking, Facility, Lean, and other labels in-house! Prints indoor/outdoor signs and labels up to 4" tall, and 40" long, that are UV, chemical, weather, water, and wear resistant, and won't fade or smear over time. 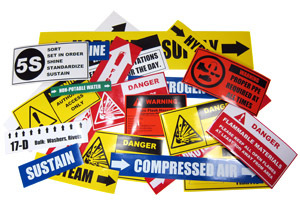 These labels are perfect for use in any environment- in an office-style scenario, or even the toughest industrial manufacturing facilities.